While pondering whether ‘Monks Cross 2′ is going to kill our city centre, I’ve been taking more notice of our ‘retail offer’, and specifically our clothes shops, some of which are pictured here. Even those of us averse to shopping have to buy clothes every now and then, and perhaps this sector will continue to flourish when the gift shops are boarded up. It seems to be expanding and thriving at present. 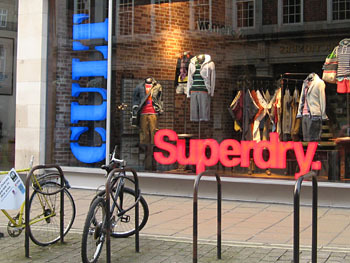 In the 21st century, Davygate is looking like the clothes-shopping destination, particularly since Cult arrived, selling super-desirable Superdry. with its confident. full. stop. There were a few clothes shops on the edges of the city centre, most memorably Renaissance on Gillygate and Wooden Horse on Goodramgate, both selling ‘ethnic’ clothing, and Priestley’s on Bootham, selling vintage clothing. But if you wanted something to wear you generally headed straight for Coney Street, to Chelsea Girl and Etam and the like. And probably Top Shop (relocated since). My mum and other ladies rather too mature for the delights of Chelsea Girl often went to Browns, particularly if wanting something for a special occasion. Chelsea Girl disappeared, Browns is still here. These days I pass by most of Coney Street’s shops without crossing any thresholds until I arrive near the end of it, when I rummage around in TKMaxx until I find some suitable bargain, so that I don’t need to go anywhere else. Hurrah. But if that fails, Spurriergate’s new development has Zara and H&M, and handily the Coney Street/Spurriergate run has extended into the adjoining High Ousegate, with Urban Outfitters recently taking over the prestigious premises vacated by Habitat, and Fat Face already well-established further along. Davygate is more exciting than I recall it being. When I was young I think it had Browns, Liberty, and a gas showroom. 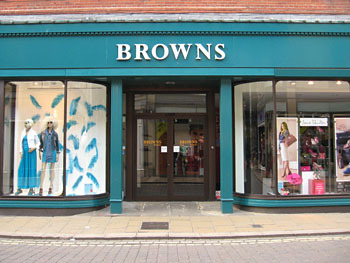 Browns has of course been on its corner for years. A few of the more expensive clothes retailers are gathered here. Then there’s the recent arrival of the Cult store in the former Borders premises. 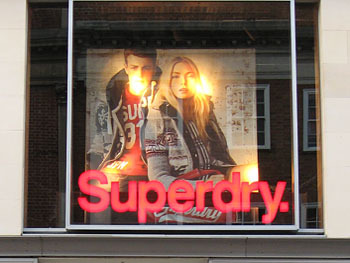 A welcome addition, particularly for male shoppers, judging by the amount of people I’ve seen wearing Superdry t-shirts. 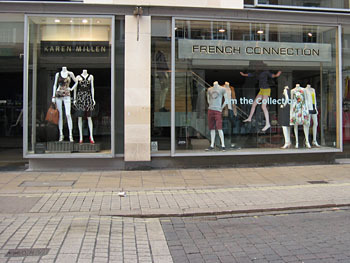 Next door, Karen Millen and French Connection. With Debenhams opposite, as it has been for years. 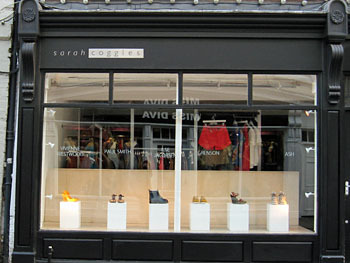 Also a presence for as long as I can remember, Sarah Coggles, on Petergate. Which, like most of the shops pictured, I can’t afford to buy anything from. But I’m glad it’s still there nonetheless. I’m more likely to be in the street around the corner, on the ‘charity shop run’ along Goodramgate. When I last looked it included Scope, PDSA, Sue Ryder, British Heart Foundation, Mind, and Save the Children. The presence of charity shops is often seen as a bad sign, as if they’re not ‘proper’ shops, and indicate poverty and hopelessness. Though of course they’re carrying out a useful role, aside from the obvious charity-supporting one, of recycling clothing. Perhaps clothes bought some time earlier in the shops previously mentioned, which we may have realised were a mistake and perhaps never wore. I think we’ve all done that, haven’t we. Talking of mistakes – this would seem to be one? 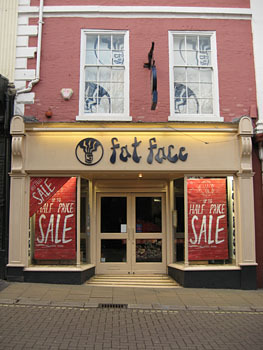 On Blake Street, another clothes shop – a big name prestigious one – though it didn’t last long in York city centre. I’m no retail expert, but it seems like a strange choice of location, doesn’t it? A bit out on a limb and off the beaten track for clothes shoppers. 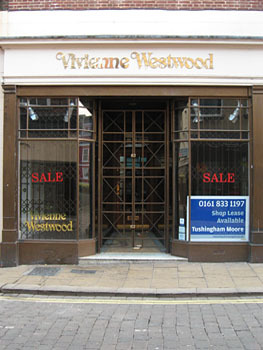 I guess the assumption was that the pull of the name Vivienne Westwood would be enough to get people down here, making a special visit. In terms of clothes shops, the death of city centre retailing seems a long way off. I am of course seeing this from my own personal perspective – as a forty-something female. Please feel free to share your own thoughts on our city centre clothes stores – present or past – particularly if you’re a man. Men seem to have enthusiastically embraced online shopping, which is, as many have said, probably a bigger threat to the city centre than anything else. Personally I’ve not had much success with buying clothing online, and end up returning it. I still prefer to head off ‘up town’ – as long as it’s not a Saturday afternoon. Coney Street packed with shoppers on Saturday afternoon isn’t as appealing as it was when I was fourteen. By Lisa @YorkStories • 20 June 2012 Shops, businesses To link to this page's proper location please use the > permalink. I think the judges lodging was in fact just that in those days, it was in later years a restaurant I think. There was a long alleyway on the left side of the GPO which had a pub or wine merchants not sure which. Watkinsons shoe shop with its Startrite shoes for children. Terrys restaurant too which vied with Bettys in popularity. Bettys window was the place to be seen!!! Upstairs was popular too. On Micklegate Hill, there was a Penningtons fruit and veg store, I remember they had quite a lot of children whom I went to school with one or two. I shop for clothes in the city centre. I go to Clifton Moor and Monks Cross for supermarkets and B&Q but it never occurs to me to go to the shops there. I know that they’re likely to hold more stock than in the centre but I don’t think I would enjoy the experience. I like the fact that I can just nip into Jigsaw to have a look at the fireplace at the back. I like the variety of businesses – a clothes shop next to a restaurant next to a hairdressers or a delicatessen. I like that I can even buy my nuts and swimming costumes in the same shop. My favourite shops are Via Vecchia, Ye Olde Pie and Sausage Shoppe, Mango and Zara. The last two are cheap enough to leave money for spending in the first two. York is definitely not just for tourists. I rely on the department stores, the market, my hairdresser, Tullivers for herbs, the cobblers, the alteration shop on Swinegate, Barnitts for just about everything. I eat out in the centre, I use the art gallery and museums, the Museum Gardens, the theatres, the pubs, the City Screen and Marks and Spencer for food on pay day. Why would I drive to an out of town shopping centre when I live in a great city which the romans designed to be small enough to walk across? You’re right Beverley, York city centre does feel more ‘human-sized’. You mentioned the larger stores holding more stock – I often feel like they hold too much for my brain to cope with. The very vastness of the planned John Lewis would put me off going. I’m so glad you mentioned the charity shops, Lisa! I get quite annoyed when people give them a bad press; they are a win-win for everyone I think. York’s charity shops are the best I’ve seen anywhere, (except possibly Durham, with its Oxfam Boutique), and I rarely buy new clothes these days. So glad you mentioned Renaissance and Wooden Horse – both sadly missed – and does anyone remember a little upstairs ‘ethnic’ boutique in Goodramgate, over the top of the Indian restaurant I think it was? That was a bargain place to buy Indian clothes when I was a student in the 1980s. Much as I like John Lewis, I have no intention of abondoning the city centre – a first class market, wonderful atmosphere, huge choice of cafes, great local food shopping… and where would we be without Barnitts?? Does anyone remember the upstairs boutique Helen mentions, or Alpha Nova? I do remember the shop in goodramgate…wasn’t it above a sort of kitchen equipment sort of place? It was indeed cheap, I bought lots of those fringed skirts from there well up until the early nineties. I miss renaissance and Audery, the brilliant lady who owned it with her husband. I remember she had a heart attack and wasn’t too well and that they were selling the place last time I was there. I liked wooden horse, my husband and I bought Rajahstani puppets there and alsort of embroidered thingies. I didn’t know it had closed as it’s ages since I’ve been to York, mainly because it now cost a fortune on the train from Manchester. I wish I remembered it – but I do remember those skirts you mention Eileen! They had an elasticated waist as I recall. I had a red one. Or possibly several in different colours, over the years. Ladies and their ‘’Shopping Hobby’s’’!,I remember my purchases,war and post war times,were very meagre/economical .Work clothes from Boyes’store next to Ouse Bridge,or the Army and Navy Store in Foss Gate.Best suit from Alexanders in Parliament St,and other (now called Leisure Clothes),payed weekly at the ‘Cheque Shop’,on the corner of Church St and Kings Square.Similar method in acquiring that essential York transport,the ‘Bikey’,from Russells cycle shop in Clifford St,and helping to block the roads during factory leaving times!. the shop was called kitchen bazzar! and you were bound to have some of those skirts, Hun, some of them had embroidery round the bottom too. I’m sorry this isn’t really about York. Me and my husband used to come to York regularly because we could get things that you couldn’t get in Manchester. There was a shop on Holgate rd that used to sell magick books and things and I loved the second hand book shops. The highlight of a day out was wine in oscars garden before it went scarily trendy. I also used to like Thomases facing the museum gardens in the early eighties I guess they had to get rid of the gas lights for health and safety reasons. Racing Green ? Coney St Popular mail order business but with a limited High St presence . Owned by dear old Sir Phillip. Does anyone remember if the close shop on the corner of ouse bridge and Skeldergate in the late 70’s possibly early 80’s was a Huxtables.I know there was one down Fossgate. In the article you mention the gas showroom on davygate. Was this a British Gas shop or something? I remember it being there in the 80s and my mum going in to pay a bill or something, the man had a manual card payment ‘machine’ and I’m fairly sure there was a one way gate or barrier type thing. I only started paying attention to town around 2000 and most things had changed a lot by then. Borders opened on davygate 98 or 99 and I remember it was massive and kept going back away from the road for ages. And there was a Starbucks or something on the top floor. Also does anyone remember the lift in BHS? I remember it was partitioned off from the lighting section into like a stock area and going in there as a child is was a bit like looking behind the curtain. Similarly the davygate arcade I remember but can’t remember if there was anything in it other than the entrance to BHS. Does anyone remember the stonegate arcade or whatever it was called? Cut through between Blake Street and stonegate. I remember nothing about that other than there being water involved? Was it enclosed? Hi Mark – I knew I’d seen some old photos at some point of the gas showroom on Davygate, and also the arcade, but it’s taken me a while to locate them. The local Press website has a gallery of images, including several of the gas showroom and the Davygate arcade: 31 old photos of Davygate & the Davygate Centre. There’s a particularly good view of the gas showroom at number 16 as you scroll through: this link might work in taking you directly to it. An interesting-looking building, which I vaguely remember, thanks for adding your memories of it. See also this link which has more info on the replacement building, when it housed Borders. You also mention the Stonegate Arcade – I wrote about it here on York Stories a few years back: In search of the Stonegate Arcade.